Citation Information: JCI Insight. 2018;3(21):e120728. https://doi.org/10.1172/jci.insight.120728. The precise mechanisms by which oxidative stress (OS) causes atrial fibrillation (AF) are not known. Since AF frequently originates in the posterior left atrium (PLA), we hypothesized that OS, via calmodulin-dependent protein kinase II (CaMKII) signaling, creates a fertile substrate in the PLA for triggered activity and reentry. In a canine heart failure (HF) model, OS generation and oxidized-CaMKII–induced (Ox-CaMKII–induced) RyR2 and Nav1.5 signaling were increased preferentially in the PLA (compared with left atrial appendage). Triggered Ca2+ waves (TCWs) in HF PLA myocytes were particularly sensitive to acute ROS inhibition. Computational modeling confirmed a direct relationship between OS/CaMKII signaling and TCW generation. CaMKII phosphorylated Nav1.5 (CaMKII-p-Nav1.5 [S571]) was located preferentially at the intercalated disc (ID), being nearly absent at the lateral membrane. Furthermore, a decrease in ankyrin-G (AnkG) in HF led to patchy dropout of CaMKII-p-Nav1.5 at the ID, causing its distribution to become spatially heterogeneous; this corresponded to preferential slowing and inhomogeneity of conduction noted in the HF PLA. Computational modeling illustrated how conduction slowing (e.g., due to increase in CaMKII-p-Nav1.5) interacts with fibrosis to cause reentry in the PLA. We conclude that OS via CaMKII leads to substrate for triggered activity and reentry in HF PLA by mechanisms independent of but complementary to fibrosis. 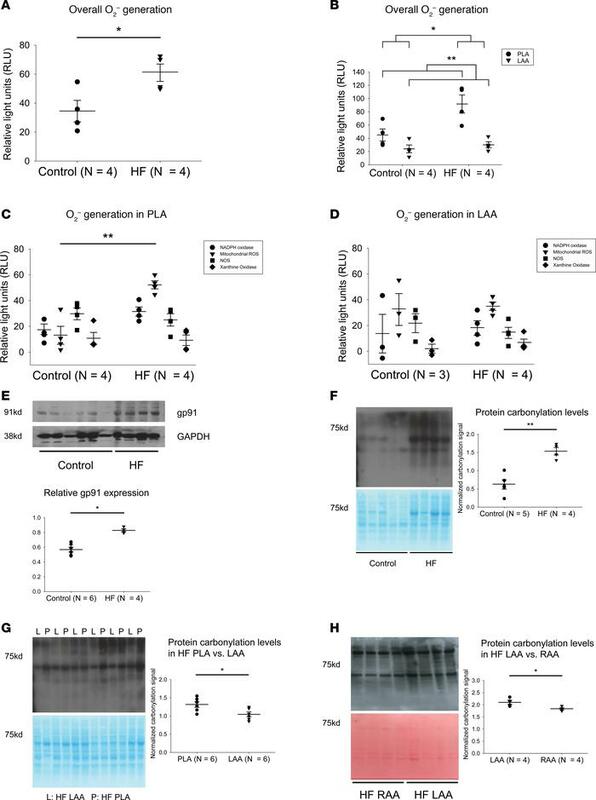 Higher O2– generation, higher expression of gp91, and higher carbonylation in canine HF PLA. (A) Overall O2– generation in atria in control and HF. (B) Higher O2– generation in HF PLA compared with control PLA and HF LAA. (C and D) Contribution of various enzymatic sources of ROS generation in PLA and LAA. NADPH oxidase and mitochondrial ROS was found to be responsible for significant increase in ROS generation in HF PLA but not in HF LAA. (E) Representative immunoblot and densitometric measurements of gp91 (normalized to GAPDH) from control and HF atria. (F) General protein carbonylation levels in control and HF atria. (G) Comparison of protein carbonylation in HF PLA and HF LAA. (H) Comparison of protein carbonylation in HF LAA and HF RAA. Data are represented as mean ± SEM; *P < 0.05, **P < 0.01. (A, E, F, G, and H) Independent t test. (B) Two-way ANOVA test of main effects. (C and D) Two-way ANOVA with Bonferroni correction on comparison of HF vs. control within each enzyme. HF, heart failure; PLA, posterior left atrium; LAA, left atrial appendage; RAA, right atrial appendage. See complete unedited blots in the supplemental material.